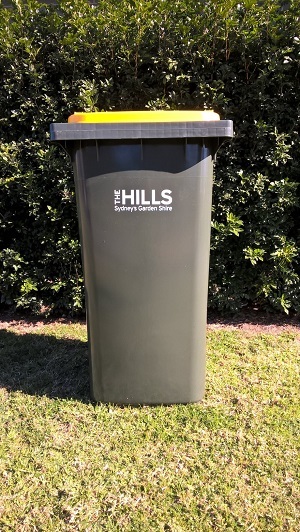 Hills Shire residents will soon have brand new yellow-lid recycling bins as part of The Hills Shire Council’s new waste and recycling collection contract with Cleanaway. Many of the Shire’s recycling bins are reaching the end of their usefulness, and replacement of all yellow-lid bins at one time is the most cost-effective and sustainable way to ensure all Council’s bins remain in a serviceable condition. All recycle bins will be replaced regardless of their current age or condition. Red-lid and green-lid bins will not be affected by the new contract. The replacement process is expected to take up to eight weeks to complete and will begin in August. New yellow-lid recycling bins will be delivered to homes before old yellow-lid recycling bins are removed and residents will receive further instructions regarding the collection process of old bins when the new bins are delivered. All old recycle bins must be presented for collection as, after the roll out is complete, only new bins, which are identified by bearing Council’s new logo will be emptied. All yellow-lid recycling bins that are collected will be recycled. New bins will not be allocated to new release areas including North Kellyville and Balmoral Road release area. For further information, visit www.thehills.nsw.gov.au or call the Waste Hotline on 1800 623 895.